UK sticksman Rob Brian has a drum clinic coming this week. 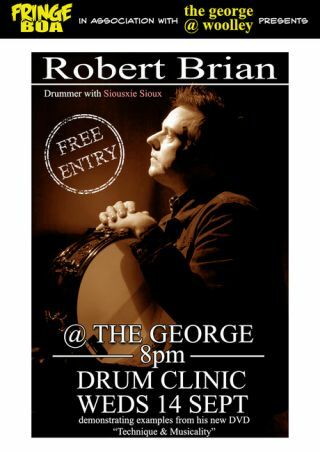 Brian, whose clinics and masterclasses are always a drum-filled treat, will perform at The George in Bradford on Avon's Fringe festival this Wednesday (14 September). The Siousxie Sioux drummer will be going through demos from his Technique and Musicality DVD (which you'll remember received a glowing four star review in Rhythm). Rob has also promised us that there will be "plenty of other shenanigans along the way" at the show. Sounds good to us. Even better, it's absolutely free to get in.